Community is, in a large way, the root of Product Hunt’s success. From its early days, Product Hunt’s creator, Ryan Hoover, has done a fantastic job of bringing the right people onto his platform and deeply engaging them through every step of the building process. Ryan has written about how he launched Product Hunt, built a great community, and grew it initially. I joined early on to help Ryan think about scaling the great community. Our team knew that in order for Product Hunt to grow for a niche community of super-users into a full-fledged community product, we had to start thinking more strategically. This article is all about how to go from initial traction to viral growth. How do you use community to expand your reach? What kinds of features and outreach are required to grow a community exponentially? From analyzing how we acquired our early users, we learned that the only way to continue growing and strengthening our community was to deliver them exclusive value beyond any they’d imagined possible. We had to give them insider access and the ability to share and elevate themselves as a part of our community. And we had to provide them a way to promote others’ projects within their own tight-knit communities. Armed with that information, we honed the product and started to launch community programs to grow the userbase beyond these initial users. Here are the steps we took to get the community to scale itself and grow well beyond our first 100, 1,000, and then 40,000 users. While it’s great to secure your first users, it’s even more important that you understand why these first people are so invested in your product. Product Enthusiasts: They just want to see great products being built. Makers/Founders: They want exposure to investors and other founders. Investors: They want to fund the next great companies. Journalists: They want to cover startups, investments, trends, etc. and break news. All of our product improvements center around serving these four groups of people. We set Product Hunt up so that our second key group — makers/founders — would get the most value of of it by sharing it as far and wide as possible. The more they share, the more their own product benefits (by getting more exposure within our community). They continue to share their Product Hunt page beyond their feature, as it provides them with positive feedback and social proof (upvotes, comments from influencers, etc). That’s how they get the real value out of it, sharing Product Hunt as a byproduct of sharing their own product. We then make it incredibly easy to share the products that are featured. For builders, Product Hunt gives them free traffic and garners both positive and constructive feedback. When building for your community, ask yourself how your product can provide such a serious value add that your users have to share it as a representation of themselves. There are countless ways to reward your first users, so think carefully about what your initial users’ motivations are and how you can reward them with extrinsic or, preferably, intrinsic rewards. This obviously is rather arbitrary and meaningless at first, since there aren’t that many users. But sell the dream. For instance, being one of Twitter’s first users is now a status symbol. It mattered for Twitter; it’s going to matter on your site too. Ryan built this in right from launch. B. Make your first 100 users feel like thought leaders. We explicitly called our first users “thought leaders.” We started incorporating curated lists — collections of products recommended by thought leaders (e.g the best “growth products”, “designer tools,” etc.) This encouraged them to share widely to further their personal brands. C. Give your first users special privileges. On Product Hunt, early users could comment and post, an exclusive ability. We told them early on that only a very small percentage of users were going to be able to do this, so it made our users feel special. As a result, they not only became our evangelists. They became our co-curators. 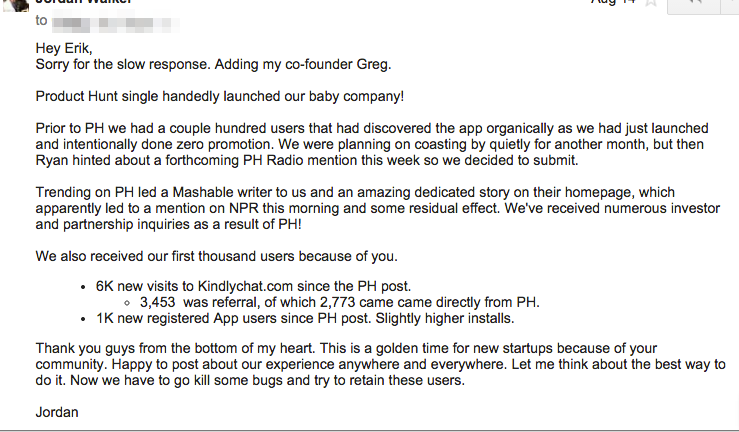 Following Paul Graham’s “Do Things that don’t scale” mantra, we gave personalized feedback to our users who were founders, passed scoops to our journalist users, and shared deals with our investors. All manually. After your initial users have a good experience, ask them — in a nice way — to share content about their experience. This creates a value-add for them, for you, and for those who will learn from the content. This is how we do it. 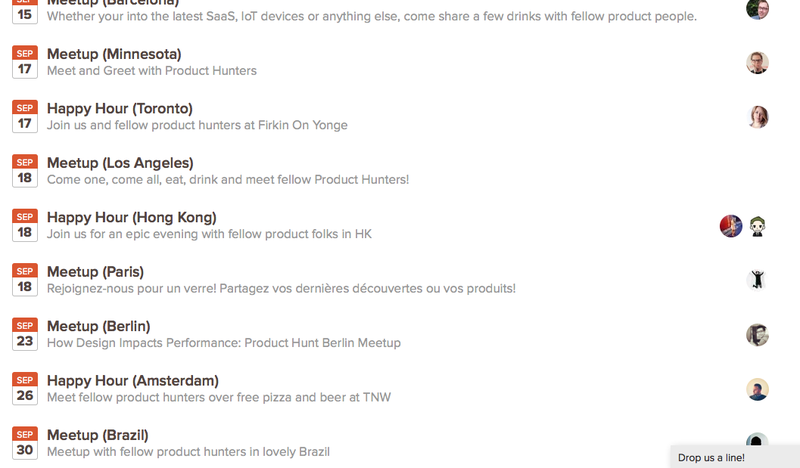 After products make the top 10 list on Product Hunt, we send their founder(s) an email congratulating them. Why do we do all this manual work? It’s friendly and casual and feels human. It includes clear questions to answer and a clear but polite and win-win call-to-action at the end. So far, we’ve had over 50 founders write blog posts about their experience on Product Hunt. We’ve even had a couple go viral: Mathilde Collin of Front did a great study of launching a product on different distribution outlets (Hacker News, TechCrunch, and PH) that got more than twice as many hits as her original post on Product Hunt. It’s important that these are not self-promotional for either them or us. It’s a much better angle to write something that would be of value to another startup, like “How to launch your product” or “How to raise 100K in 10.5 hours” using Product Hunt. No one wants to read about how awesome your startup is or that you think Product Hunt is cool. They want to read something that can help them be successful. Whatever content is written should add value to the audience as a whole rather than push an agenda or brand. If you give users a great experience, they’ll be more likely to share that experience. If you ask them to share that experience in a no-pressure way, they’ll be 10x more likely to share that experience. If you ask them to share that experience in an no-pressure way that will also help their own business… that’s how you get 50+ people to write posts about your company. 4) Engage your community and enable them to help with very little effort. We are even going to publicize our product roadmap so Product Hunters can see it evolve and give us feedback. Asking questions like these (and featuring the best answers) keeps conversation flowing and builds community over time. Host happy hours and offline events and give your community the power to organize and lead these themselves. These are fantastic events because they bring adopters together and they form real life, lasting bonds with each other — under the context of your community. Think about how strong that is: When people ask “How did you guys meet?,” for the rest of their lives, our community members who meet at our events will say “Through Product Hunt.” People may forget an email exchange, but they are unlikely to forget meeting like-minded community members in person. How do you organize and then get your users to host meetups that scale? First, think about what your users will get out of being associated with your brand and being a leader in your community. Will they be able to connect more deeply with dozens – or hundreds – of people just like them in person? Will they get to promote their own company somehow? Identifying and articulating that value proposition is key. Once you have figured out your value proposition, advertise your meetups and encourage your users to host and make it easy for them to do so. Advertise it and encourage them to take ownership — show them that they can encourage their startups, give them special status + privilege on the site. It’s important that your users take ownership of the event. You are simply supporting and promoting, but locals have to organize it. This takes the burden off you, of course, but also allows them to personalize and make each event special. And, if you can, go to the meetups! I have been to SF, NYC, Boston, and Philadelphia meetups, and maybe some day I’ll even go overseas to meet Product Hunters. Going to the event gives them the huge boost to rally a few hundred people and they can launch monthly meetups from there. People appreciate this. Some have even driven across states to attend our Product Hunt meetups. You can’t grow your userbase exponentially by doing things that don’t scale, but you can certainly build deep connections with those first people, connections that will endure and spread through each of those people’s communities. From that point forward, it’s about building a better product, asking your current users to share, and giving them a piece of the pie and allowing them to take on leadership roles that benefit them. And you can do all of this without spending anything at all on marketing. That’s the power of community – you’ll go further, you’ll spend less, and you’ll make the world a better place for your users.